From playing College Walk as part of the Morningside Mountain Boys in 1962, to performing live with Steve Martin on The Late Show with David Letterman, Pete Wernick ’66, ’73 GSAS has lived and breathed bluegrass music for more than 40 years. The International Bluegrass Music Hall of Fame inductee formed his first real band at Columbia, rehearsing in Ferris Booth Hall, and soon after hosted a bluegrass show on WKCR — the only one of its kind in New York. “At 17 or 18 I became important, if you can call it that, as the guy who played bluegrass on the radio,” he says. Suddenly the kid who grew up near the Bronx’s Van Cortlandt Park with a math teacher father and librarian mother — a kid who taught himself banjo by jamming with friends, and who was fast-tracked through junior high school and enrolled at Columbia at 16 — was backstage at music festivals in the South and the standard-bearer of bluegrass music for the New York metro area. He interviewed the Stanley Brothers, the Greenbriar Boys, and Bill Monroe and his Blue Grass Boys, names that would come to define the genre, and broadcast them all citywide. After majoring in sociology at Columbia he stayed on, earning a Ph.D. in the same subject and soon after his moniker, “Dr. Banjo.” In 1970 he moved upstate to take a research position at the International Population Program at Cornell, and on a trip to Boulder he met his wife, Joan Leonard. They’ve been together more than 40 years and have a 31-year-old son, Will, a filmmaker in Los Angeles. With the banjo book selling,he and his wife moved to Colorado to do just that, settling down by a dirt road outside Boulder. Soon thereafter Wernick produced his first solo record, Dr. Banjo Steps Out, and put together a band named Hot Rize, after the secret ingredient in Martha White Self-Rising Flour, an iconic sponsor of Nashville’s Grand Ole Opry. With Tim O’Brien on lead vocals, mandolin and fiddle, Wernick on banjo and harmony vocals, Charles Sawtelle on guitar and vocals and Nick Forster — who went on to host the nationally syndicated radio show eTown — on bass, Hot Rize climbed to the top of the bluegrass mountain. Through the 1980s they regularly appeared on NPR’s A Prairie Home Companion and The Nashville Network’s Ralph Emery Show, and often appeared on the television show Austin City Limits. Hot Rize produced nine albums and became a hit international band, playing 47 states and 15 foreign countries and becoming one of the best-selling bluegrass acts of all time. He also authored books and produced DVDs on bluegrass and continued to teach, eventually developing the Wernick Method for bluegrass, which emphasizes group jam sessions rather than solo practice. Today the Wernick Method makes up the bulk of his business, drbanjo.com. He struck up a friendship with Martin, a longtime banjo player, after the success of Hot Rize. Wernick helped Martin with his banjo playing, and Hot Rize played the actor’s wedding to Anne Stringfield. 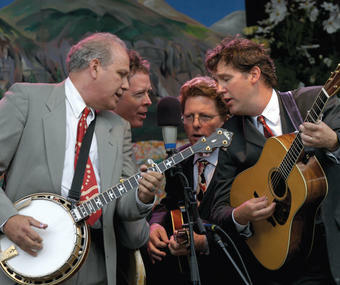 In spring 2005, Martin asked Wernick if he wanted to join him and Scruggs (who died in 2012) at The New Yorker Festival for a talk on bluegrass and banjos. As a sort of last-minute bonus, the Letterman people called — having read of the festival talk — and asked them to play the show. Hear Pete “Dr. Banjo” Wernick ’66, ’73 GSAS perform..
Michael R. Shea ’10 Arts is a freelance writer in New York City.